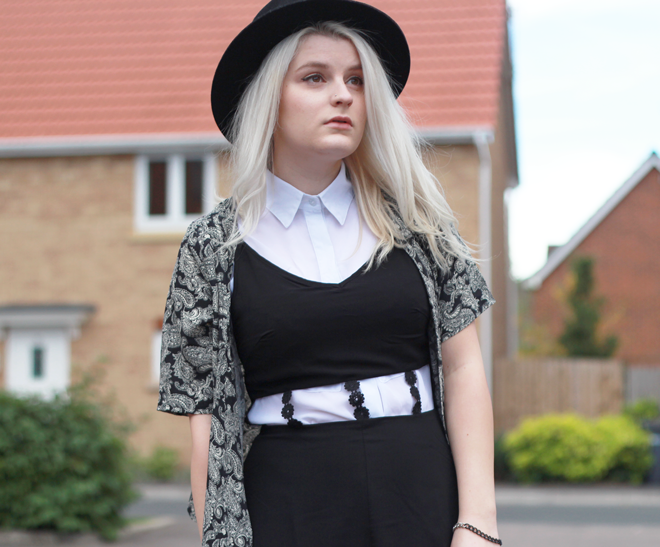 So, here's the second outfit from the Blogger Edit with that kimono from Missguided. Now, I've got to admit, I don't wear playsuits all that often. They're quite a faff when it comes to going to the bog - let's face it (yeah, can't be shy of such deets!). But for this playsuit, I'm willing to make put up with the inconvenience! The daisy chain detail makes it perfect for layering up with a tee or shirt. Fave playsuit EVER. If you guys haven't already entered, I've got a giveaway running until Halloween to win a skirt with OASAP. Click here to head to my previous post where you can enter! Hope you all have super-duperlicious weekends! Gorgeous outfit robyn!!! You look amazing in this post! I love the idea of wearing a shirt under a playsuit, looks great! Ah so perfect! I love your layering, it looks awesome! Love the print on the kimono too! I love how you've layered the playsuit with a shirt underneath, looks lovely! YOU ROCK THAT KIMONO LIKE NO OTHER!! I like your choice of head gear as well. SHNAZZY. All in all, total babesville. The outfit really SUEts you. Snuck SUE in didn't I? Yes, I did! Saturday is nearly here and I may do a little dance.. I love, love, love this outfit on you! I've always avoided cut out playsuits but never thought of adding a shirt, good shout.